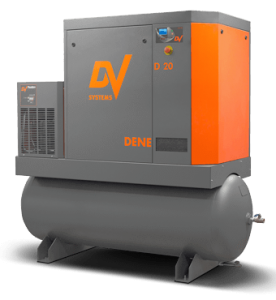 This 20HP Rotary Screw Compressor , the D20 by DV Systems is a rugged and reliable Canadian made product. Available in both base and tank mount styles and optional VSD drive for efficiency and versatility. The tank mount version of the 20HP Rotary Screw Compressor also includes a refrigerated air dryer and prefilter. Proudly distributed (and serviced) by Centrair Air Systems.